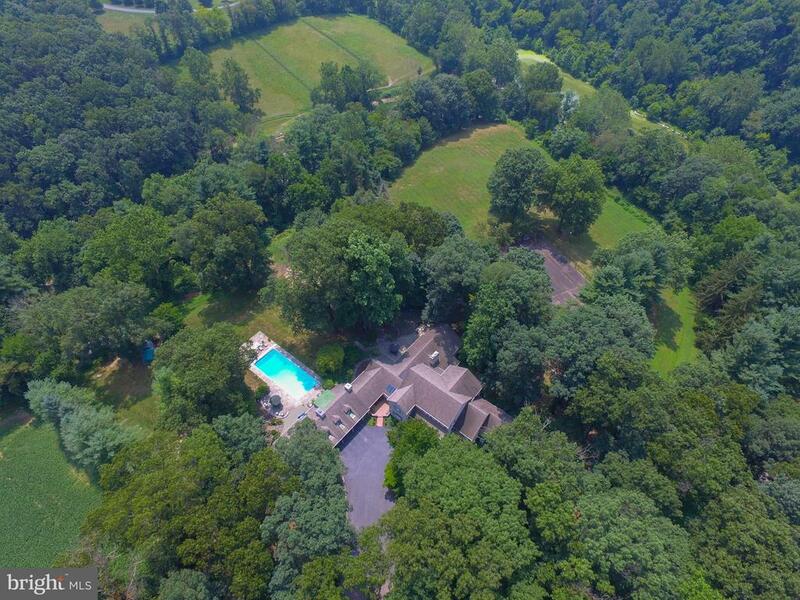 Impeccable luxurious home sprawling on over 18 acres, this warwick township property offers the amenities and luxuries of a resort in the warmth of home. As you arrive the grande circular driveway, gaze on the soaring trees enclosing the property and natural landscaping. The 2-story home features over 12,000 square feet of total living space including 5 bedrooms, 5 full and 5 half baths, home theater room with row seating, and so much more. The exterior offers multiple patios, a gunite in-ground pool, and private tennis court. Once you see the interior you will fall in love with the home and not want to leave. The main level has an astonishing kitchen with oversize center island with granite countertop, a pass-through window into the dining room, and viking gas cook top with vent. Hardwood floors lead to a great room with wood burning fireplace, an office with custom french doors and a sunroom with an exceptional view of the land. A 1st floor master bedroom is more like a penthouse suite with walk-in closet and attached master bath with hydromax jetted tub, stall shower, and twin vanities. Alongside the garage is a staircase that leads to an in-law apartment that is connected, but in its own section of the home. It hosts its own great room with wood burning fireplace, full kitchen, open room (possibly a bedroom) and sunroom with cathedral ceiling. Other convenient features of the home include a main floor laundry room with built-in counter, a craft room, and generous windows and doors throughout that provide entry to the patios and pool area. This is only a small glimpse of the home. You must view this residence in person. Enjoy the luxury of gated country club living in this bent creek home located on the 16th fairway. Four spacious bedrooms (plus 5th br, if needed)/ custom office/elaborate gourmet kitchen loaded with top-of-the-line details & appliances/custom hardwood & ceramic tile floors/amazing great room with fireplace & lovely built-ins/fabulous sunroom drenches this home with natural light/scenic koi pond & waterfall with bridge/ incredibly finished lower level with exercise room, guest suite including kitchenette, bedroom, full bath (handcapped accessible), and wine cellar. Large 1st floor mudroom with custom dog wash. Too many special features to list. This one is not to be missed! Witness the majesty of this exceptionally maintained custom-built home in the coveted millpond estates. Elegantly detailed with tray ceilings, custom moldings, and decorative pillars, this home is also practical in function with 6 bedrooms, 4. 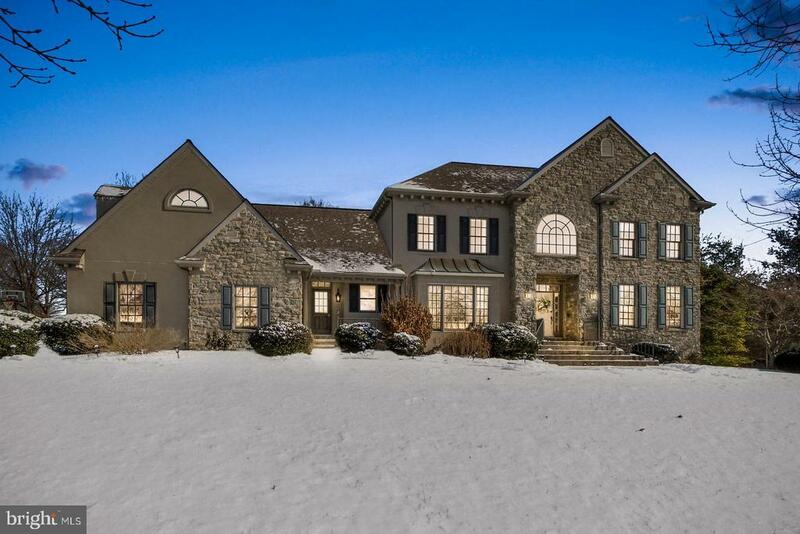 5 bathrooms, finished walk-out basement, and 3-zone heating/cooling system! Entertain privately on over half an acre; the open floor plan begins with a generous foyer that flows seamlessly to a formal dining room, custom gourmet kitchen, vaulted ceiling living space, screened-in porch, composite deck, office, piano room and dual staircases. A separate mudroom entrance leads you to a powder room, built-ins for dropping off backpacks and shoes, and direct access to the 3-car garage--which also has a separate staircase into the basement! The walkout basement is a comfortable 1200 extra square feet of carpeted space with a private bedroom and full bath. It is also equipped with a wine cellar on an independent cooling system! Upstairs, you have 5 bedrooms, including a castle-esque master suite. Retire to your private sitting/nursery room, luxury bath with whirlpool tub & tiled shower, or straight to bed--surrounded by a tray ceiling and crown moldings. Each bedroom has hardwood floors, ceiling fans, and window treatments. Some are equipped with built-in trunks that also serve as window seats. A spacious cedar closet and insulated attic storage are accessible from the upstairs hallway so you can store things without having to run to the basement. This home comes with a security system, surround sound, radon mitigation system, water treatment system, newer furnace, recessed lighting, and unbelievable curb appeal. See for yourself in this 3d virtual tour: https://my. Matterport. Com/show/?m=sxxad38eqgm&brand=0. If you have a vr headset, use this link: https://my. Matterport. Com/vr/show/?m=sxxad38eqgm. Lititz is the 2013 winner of budget travel's "america's coolest small towns" competition. Make yourself home in this one-of-a-kind beauty in a peaceful, established neighborhood! Golf course views and plenty of natural lighting make for an open, sunny floor plan at this bent creek home. Featuring 6 bedrooms, 4 1/2 baths, and over 6,000 sq ft of living space, this property stands out at every turn. The kitchen is impressive with 2 islands, a breakfast area with patio access, and a double-sided fireplace which also warms the family room. An amazingly spacious dining room with tray ceiling offers the best for get-togethers and events. The luxurious first-floor master suite will relax with its jetted tub and roomy walk-in shower. The unbelievable amount of living space and storage continues to the lower level with a kitchenette, office, full bath, crafts room, media room, exercise room, and workshop. At the end of the day, relax on the patio and enjoy the surrounding views from the comfort of your own home.